Welcome to Computer Fundamentals Notes. 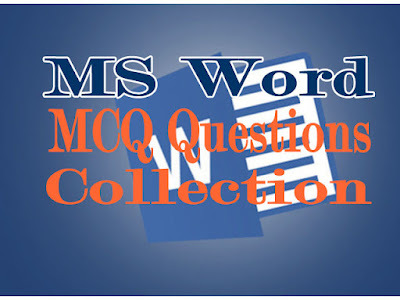 In this MS Word MCQ Questions Collection we are presenting more than 400 multiple choice questions from Word Processing and MS Word topic and in this current post we'll share 50 important multiple choice questions with correct answer and explanation. 14. With Word's AutoCorrect entries, to display an indifferent face ( 😑 ) type _____. 25. How will MS Word respond in repeated word. 28. What do you call 'a collection of character and paragraph formatting commands'? 36. When typing in a word field manually, what must you press to insert the code's braces? Preparing computer jobs exams? You can't stay away from mcqsets.com! Explanation: There are two positions for drop cap namely, Dropped and In Margin. Explanation: You can save a document in three ways - using shortcut key, using toolbar button or using menu sequence. Explanation: You can drop maximum for 10 lines for a drop cap. Explanation: Unless you change the number of lines to drop for Drop Cap is 3 lines. Explanation: You can increase up to 10 in Lines to drop box in Drop Cap dialog box. Explanation: You can insert columns in MS Word you can insert up to 45 columns. Check Layout >> Columns >> More Columns and then enter large number like 100 in number of columns box and click OK. MS Word will display number of columns should be between 1 and 45. Explanation: You have up to 200% in scale box in Font dialog box. Explanation: The maximum font size available is 1638. Check by entering some larger number in font size box. Explanation: By default the tab stop position is half inch. You can change it in Tabs dialog box. Explanation: The extension .doc indicates that it is Word file. The newer version of Word document has .docx extension. 14. With Word's AutoCorrect entries, to display an indifferent face (😑) type _____. Explanation: If AutoCorrect entries is enabled you can type a colon followed by vertical bar :| to create indifferent face emoji. Explanation: You can click on Edit Data Source to open records of data source through main document in Mail Merge. Through there you are allowed to add, delete or change the records. Explanation: The minimum space required between columns is 0". Check by entering in Space Between box of Columns dialog box. Explanation: You can not set less than half inch in Column Width box of Columns dialog box. Explanation:All of those are the default value for a new document. Thus All of above is the correct answer. Explanation: Default page setup value for new Word document. Explanation: In Word 2003 the default left and right margin is 1.25"
Explanation; Default style for footnote in Word 2003. Explanation: Default font size for new document in Word 2003. Explanation: There should be at least one row and one column when you insert a new table in Word document. Explain: The repeated word will have a red wavy underline to indicate error. Explanation: A form letter is merged document. A database of name and address will be the data source for mail merge operation. Thus a sales brochure can be a main document for merge operation. Explanation: F8 button is used for extended selection. Pressing it for one time will enable extended selection, two times will select a word and pressing it for 3 times will select a sentence. Successive press will select paragraph and whole document.